Blood Purification – filters and purifies blood by providing more oxygen and helps the production of healthy red blood cells and nutrients throughout the body. Intestinal Cleansing –improves intestinal peristalsis (bowel movement) and helps in disposing off waste matter ( viruses, bacteria, heavy metals, aged feces, etc.). 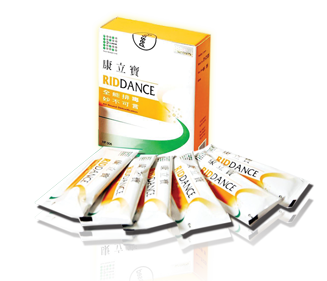 Riddance should be taken for 5 to 10 days as it is, NOT diluted in water, before breakfast and before bedtime (1 sachet for adults and ½ sachet for children). Increase frequency of bowel movement to 3-5 times or more, to move out accumulated waste in the body. Feces/ excrement will be dark and has strong odor. Bowel movement will gradually return to normal once toxins are moved out.